Surf shops converged at Seaside Reef on Friday for the first stop of the Oakley Surf Shop Challenge where San Diego County’s best shops competed for the opportunity to represent their region against six other regional finalists from North Carolina, New Jersey, Florida, Northern California, Southern California and Hawaii. With waves in the waist-to-chest-high range and sunny springtime vibes in full effect, the beach filled up bright and early, with surfers and their supporters alike. The small mix of WNW and SSW swell made for a running left at Palisades and a longer right breaking out front of the parking lot. This alone would divide surfers, making their choice crucial for their success into the final round. With the unconventional relay format, giving each team the additional option to choose a “whammy” surfer whose top score would be doubled, the intensity of competition built as the heats raged on and time winded down. Upon completion of the first round, the field was narrowed to Surf Ride (Oceanside), Surf Ride (Solana Beach), Sun Diego Boardshops (Carlsbad), Rusty Boardhouse (La Jolla), and Clairemont Surf Shop (San Diego) who would see the final round. As the final kicked off it became very clear that the battle would be between Sun Diego Carlsbad and Surf Ride Oceanside. Oliver Kurtz kicked off Surf Ride Oceanside’s campaign with a solid 6.93. Taylor Clarke of Sun Diego Carlsbad answered back with a 7.80, whammied the wave, and the bout raged on. However, it would be the Surf Ride employee/grom Chris Murnane who would push the team’s highest score, a 7.10 for a combo of backside turns, and give Brent Reilly a boost going into the final leg of the rally. Brent Reilly and Ricky Whitlock took the final to the end, as Whitlock’s whipping backhand landed him a 7.03. 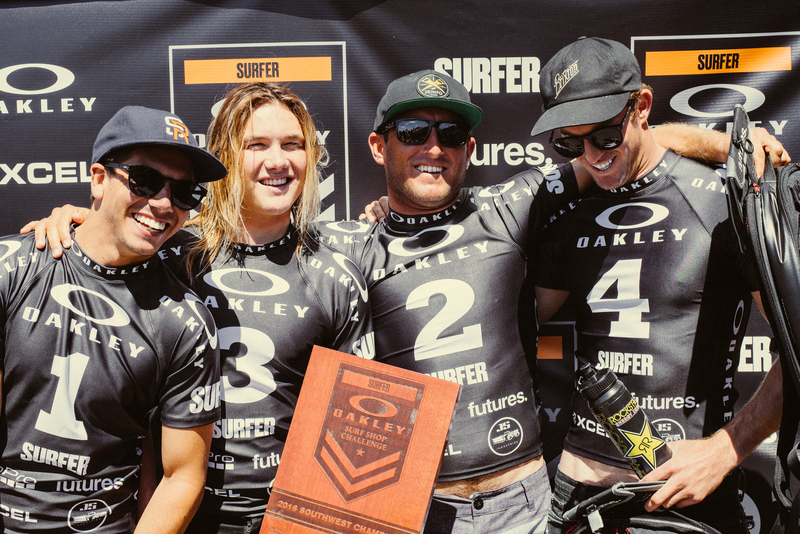 It wouldn’t be enough for Sun Diego Carlsbad to take over the lead as Reilly finished the affair with his ultra-smooth backhand, grabbing a 6.83, as Surf Ride Oceanside claimed their fourth Southwest Regional Oakley Surf Shop Challenge Championship. The Surf Ride Oceanside team will meet the rest of the regional qualifiers this fall at Lower Trestles, where they will battle for the title of the best surf shop of America, a $5,000 prize purse and a grand prize all-expense-paid trip to the 2016 SURFER Poll at Turtle Bay Resort on the North Shore of Hawaii. Check back as the Oakley Surf Shop Challenge carries on around the United States.